Disclaimer: Any appearance of real brands appearing on these work-in-progress screenshots is only tentative, we are still negotiating with the European truck manufacturers trying to get their approval to portray their fully branded vehicles in our game. How the f*ck are we gonna wait several months for this?? I'm so eager to play. Looks fantastic. 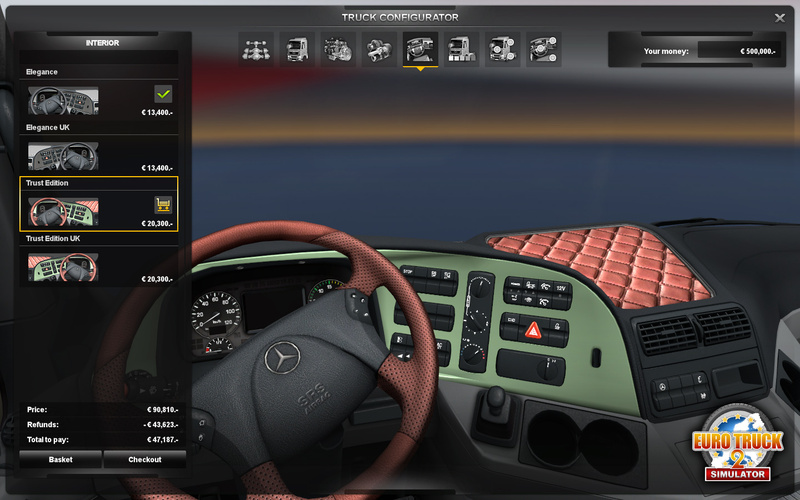 Really good, Changing Steering Wheel to UK Version, Changing chassis for 4x2, 6x4. REALLY GOOD! het word de max's is nu hopen dat het 12.1.2012 is voor ets2. Thank you very much for this glimpse on gameplay! The tuning screen seems clean, tidy and straightforward, while tuning itself seems to provide a plethora of options. Can't wait to try it out! OMG! Ta very good, graphics, images. Even with only two images have to see quite a lot of changes on the trucks. And finally in all editions of Truck Simulator, this finally came with the trucks with the 6x2 and 6x4 tractors. And practically, almost all of the changes to the truck, those photos are already driving me crazy, I hope of launch this game at least in the first half of 2012! And good luck in negotiations with manufacturers of trucks. Really, really interesting! I'm just anxious to buy it! 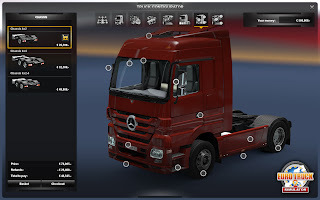 This new tunning feature seems to expand so much more the gameplay as we will have several functions to choose and combine in the trucks. Really apreciated! PS: What about international stickers? Very very VERY nice work! Yes nice work. Hope that all will be good. Very very very nice people!! I cant wait to have ets2,too. Im waiting every day whenn it come out. What can I say? It's awesomeeee!!! Beyond my expectation SCS, thank you very much. Awesome. I cannot wait for this to come out. I totally own everything on UK Truck Sim and am ready for the new challenge of conquering the new Europe game (when it finally goes on sale). Any chance of a due date yet? Looks very nice so far, love the option to switch between left and right hand drive. How about another chassis configuration, 6x2 with rear lift axle and 8x4 for the big boys? It must have 8x4 chassis. Sry for my english if it's wrog. Perfektní práce, tento screen mě konečně přesvědčil, že tuning už nebude jen motor na úroveň 2 atp. Ale nakonec mě, jakožto map makerovi bude stačit ke štěstí pořádný editor nabitý modely, různými prefaby atd. Nicméně jeden hodně promakaný prefab jsem už viděl na screenech mostů. Takže držím palce a těším se, až se budu moci ponořit na hodiny do editoru v ETS 2 a své výtvory pak ukazovat ostatním. Nicméně jak tak koukám, vyrovnat se kvalitám originální mapy již nebude tak lehké. Worthy to wait! Beautiful work! Thank you. This is awesome! Let us just hope that they fix the steering wheel problems that they always have had. And manual gearbox (G25, G27) support! WOW its going to be hard to wait but it will be well worth it!!! Awesome job SCS looks fantastic! this is something so awesome and so amazing! Cant wait for this to release! Splendid work. Can't wait till release. I think you should allow us to completely customize intererior, that would be awesome. very good! What is the release date? I'm Speechless its amazing. its like a modern Pttm same options but better! I'm watching Gran Turismo 5 and Gran Turismo 5 Prologue trailars. I can to compare Euro Truck Simulator 2 with a Gran Turismo. Are two great games with different focus, but really very realistic, give pride of your respective producers, SCS Software and Sony Computer Entertainment. I like cars like nobody. I think few can imagine how. Trade my bride for a ride in a Ferrari California, a Porsche 911 Turbo or a Lamborghini Gallardo LP570-4. So, you, from SCS, Sony, Microsoft, EA, and others, realize my dreams, since it can't possibly walk in my dreamed Porsche. I have much to thank you, I know they're doing their job, but leave the world better. but in the second image the pink part looks like 2d. What man can say about this? Can you also choose a licence plate from different country's? oh yes, that is a good idea with the licence plates. different countries and different licence plates. every country has his own plate, and the playeer can choose his plate. can you include oval stickers for every country to stick them on the truck or on the trailer?? I would like to havw original registration for the trucks and for the trailers,too. Please put real plates into game. Are there also going to be Iveco's? Because I didn't see them yet. And can you also hire people again in this game? can we choose special lights, like light bulbs and plate with name in front of window?? I WANT SCANIA R730 !!!!!!!!!!!!!!!! When will we see a new update ? Hoping to see it on my desktop before Christmas :)"
You are making me wanting to get the game even more! ps when does it come out in the uk and how much is it in gbp? Me encantaa! Muy bien hecho. Enhorabuena! What difference will make when we upgrade from 4x2 to 6x4 ? Is there will be any differences besides how truck look? It would be great if changes will be not only in appearance but in technical side of a truck to. The truck world of Gran Turismo. What is about Drawbar Trailers? ( I hope its right in English) In Germany wie call it Hängerzug or Gliederzug. great post I got it interesting.